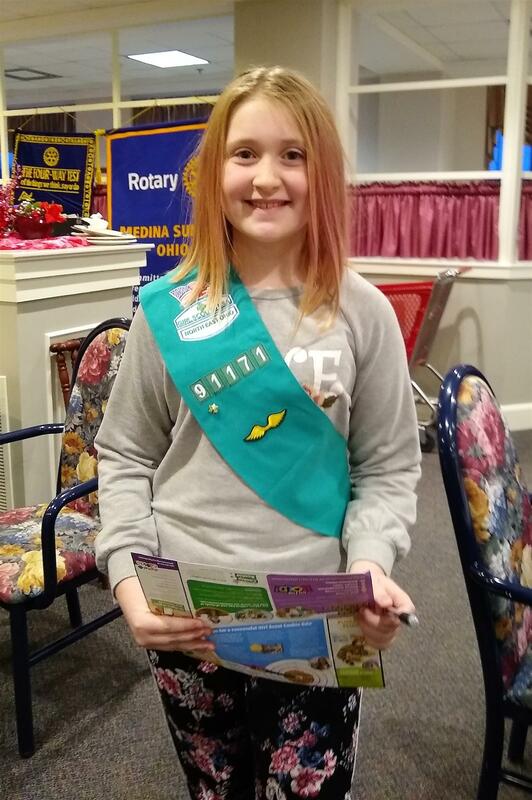 Ava Kanieski, from Girl Scout Troop 91171, brought her smile and Girl Scout Cookie order form to Medina Sunrise Rotary this frosty January morning. "Sure, they’re awesomely delicious, but beyond the sweetness, Girl Scout Cookies are an opportunity for girls to do extraordinary things," said Ava. When you make a Girl Scout Cookie purchase, you’re helping the next generation of girl entrepreneurs get an important taste of what it takes to be successful—teamwork, planning, and a positive outlook (for starters). Proceeds from your purchase stay local and help power new experiences for her and every awesome G.I.R.L. (Go-getter, Innovator, Risk-taker, Leader)™ who sells Girl Scout Cookies! Whether it’s a trip she’ll never forget, a service project that will change her community forever, or the opportunity to build a lifetime of memories at camp, Girl Scout Cookies help make it all happen!